Upgrade your Saturday afternoon cookout by hand-crafting—or hacking—a grill. You'll flip for any of these five DIY designs! For charring kebabs at afternoon barbecue or roasting s’mores at sunset, the grill is arguably the most classic—more than that, most important—of summer staples. While our favorite commercial gas and charcoal models aren’t going anywhere, it’s fun to think how creative we could get if we crafted our own personalized barbecue gear. Whether you’re looking for a portable solution to take on your outdoor adventures or you just want to build out a backyard entertaining zone, you’ll flip for these five DIY grills—and be flipping burgers by the end of the weekend. If a skateboard can handle the force of a frontside flip, it’s certainly sturdy enough to support the flip of a hamburger! To make this cool conversation starter, the makers at Handmade in America welded steel table legs to two skateboard decks and cut a portable grill–sized hole in the middle of the recycled tabletop surface. 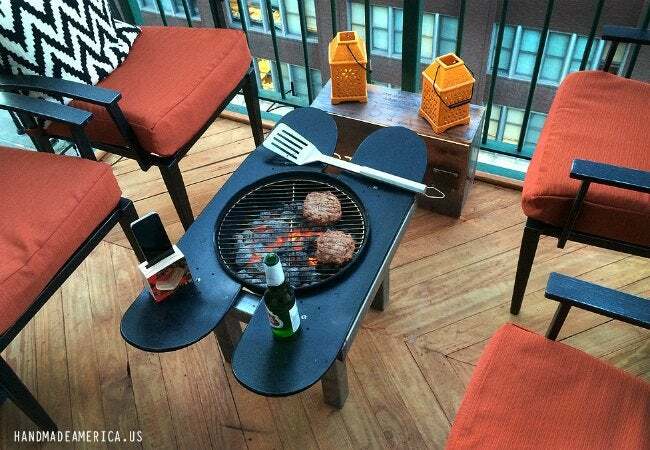 This smart design not only creates one-of-a-kind deck decor, it also offers extra room for stashing refreshments, grilling tools, or whatever else you need nearby. 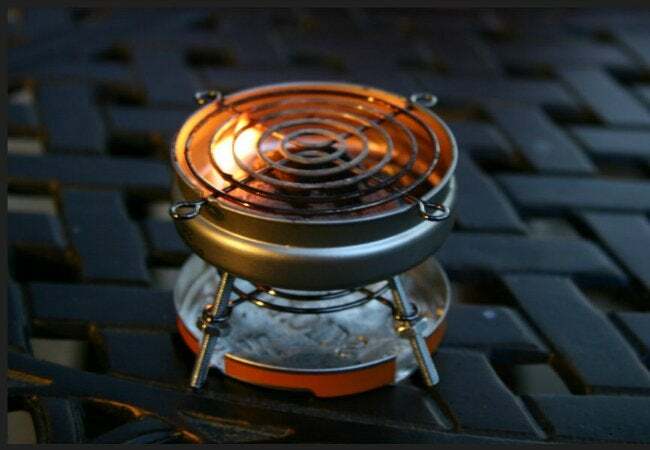 Powered by one charcoal briquette and adorably housed in an Altoid Sours tin, this small-but-mighty Instructables grill is capable of cooking a full-size hotdog (in halves) or a slider-size burger. And really, what more do you need for a personal picnic? With a few tiny tools, some salvaged materials, and a little patience, you can craft this mini marvel that’s ideal for a camping trip or as a fun—and functional!—party trick. 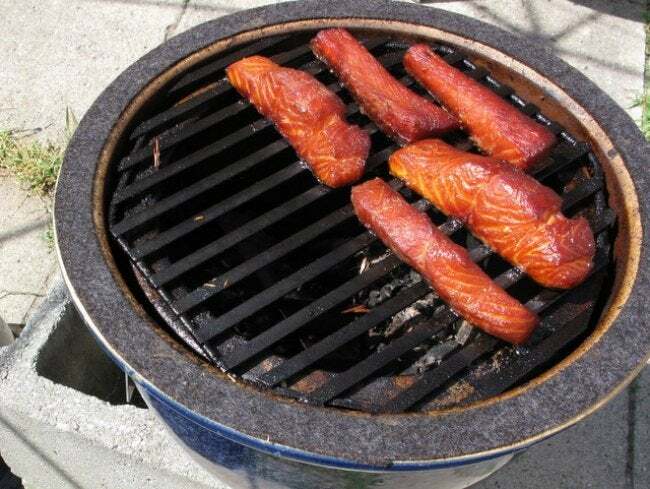 Forget about the Big Green Egg phenomenon. Zone 12 Project Group is here to show you how to build an inexpensive—but just as effective—DIY version from two glazed ceramic pots. The key to making this “Little Blue Egg” a success is finding pots that can nest, because the inside pot will act as the firebox in this contraption. But once you find the perfect pair, you’re only a few tools and a day’s work away away from grilling greatness. Some workers may stash their sandwich in the top tray of a toolbox to bring to work, but with this Instructables tutorial you can use one to carry and cook your meals. 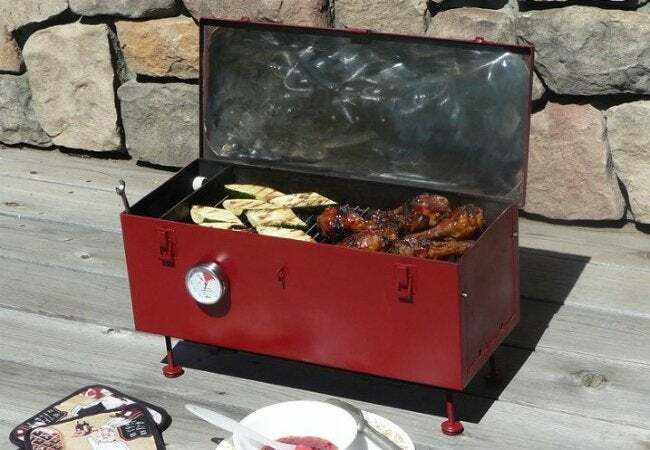 Make the perfect grab-and-go grill from an old metal toolbox, repurposed grates, and a few power tools. Because most of these materials can be found or scavenged, your biggest investment in making this little cooker will most likely be a bit of elbow grease. Perfectly cooked, bite-size deliciousness—coming right up! 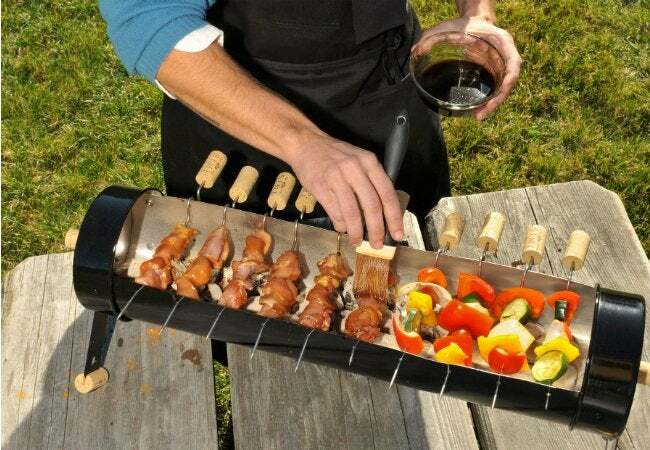 Never again worry about skewers falling through the grates or getting stuck to the grill with this handmade Japanese-style skewer grill from Makezine. Moldable aluminum sheet metal curved between two round cake pans serves as the grill’s structure, while small holes punched along the sides hold your skewers steady until dinner time.